So what's the Higgs boson, and why are people spending billions of dollars to find that god-danged subatomic particle? I've rounded up a variety of resources aimed at showing you why the hunt for the Higgs is a big deal. First, a little context: The Higgs particle, and its associated field, were hypothesized back in the 1960s by British physicist Peter Higgs and others to fill a weird gap in the Standard Model, one of physics' most successful theories. The model as it stood had no mechanism to explain why some particles are massless (such as the photon, which is the quantum bit for light and other types of electromagnetic radiation), while other particles have varying degrees of mass (such as the W and Z bosons, which play a part in the weak nuclear force). By rights, all particles should be without mass and zipping around freely. The Higgs mechanism sets up a field that interacts with particles to endow them with mass, and the Higgs boson is the particle associated with that field — just as photons are associated with an electromagnetic field. For more than four decades, physicists have assumed that the Higgs field existed, but found no experimental evidence for it. It requires a super-powerful particle smasher such as the Large Hadron Collider to produce energies high enough to knock a Higgs boson into existence under controlled conditions. The teams at the LHC's ATLAS and CMS detectors are likely to say they're pretty sure they see a new type of particle with Higgs-like characteristics, but will need more time to nail down those characteristics completely. If that's the case, physicists can then go on to find out if the Higgs mechanism works exactly the way they expected it to, or whether there are unexpected twists. Some of the theories about how the universe is put together are pretty far-out — for example, suggesting that there are several dimensions in space that we can't perceive directly, or that there are huge troops of subatomic particles that we haven't yet discovered. 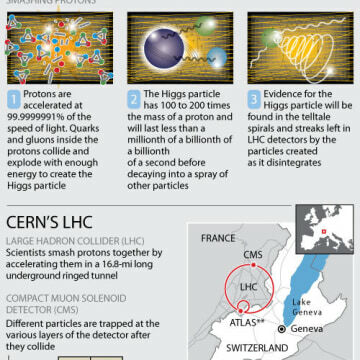 Following the tracks left behind by the Higgs could reveal whether there's any truth to those theories. For decades, experts have been trying to come up with analogies to illustrate how the Higgs mechanism works. One of the best-known was proposed in 1993 by David Miller, a physicist at University College London. Imagine looking down from a balcony in a ballroom, watching a cocktail party below. When just plain folks try to go from one end of the room to the other, they can walk through easily, with no resistance from the party crowd. But when a celebrity like Justin Bieber shows up, other partygoers press around him so tightly that he can hardly move ... and once he moves, the crowd moves with him in such a way that the whole group is harder to stop. The partygoers are like Higgs bosons, the just plain folks are like massless particles, and Bieber is like a massive Z boson. The Guardian's Ian Sample demonstrates a variant of this analogy in a 4.5-minute video: Imagine a tray with ping-pong balls scattered on it. The balls roll freely around the empty tray. But then, if you spread a layer of sugar over the tray, the balls sitting on the piled-up sugar don't roll so easily. The grains of sugar introduce a kind of inertial "drag," and that's the kind of effect that the Higgs field supposedly has on particles with mass. In a 60-second shot of science written for Symmetry magazine, Howard Haber of the University of California at Santa Cruz uses a livelier comparison to a high-speed bullet plowing through a vat of molasses. If one picture can be worth a thousand words, how much are six videos worth? 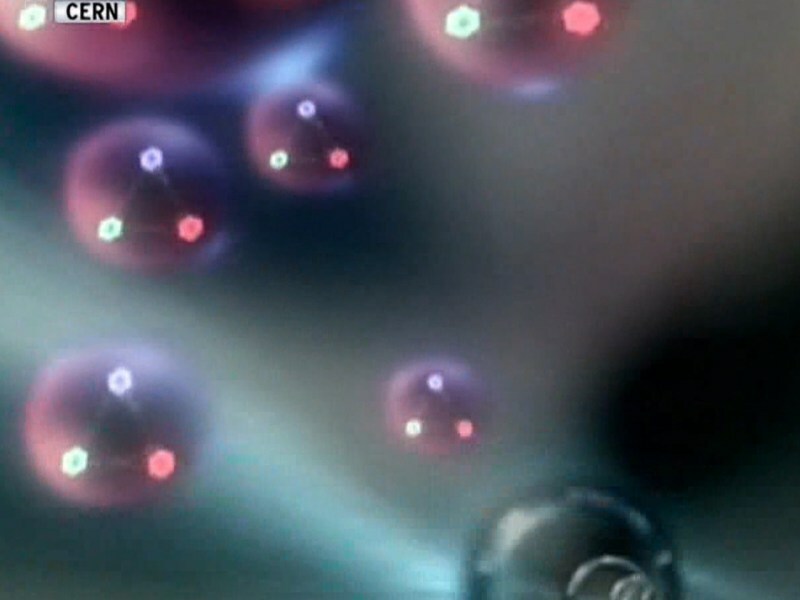 Here are half a dozen videos that delve more deeply into the Higgs boson and its significance. 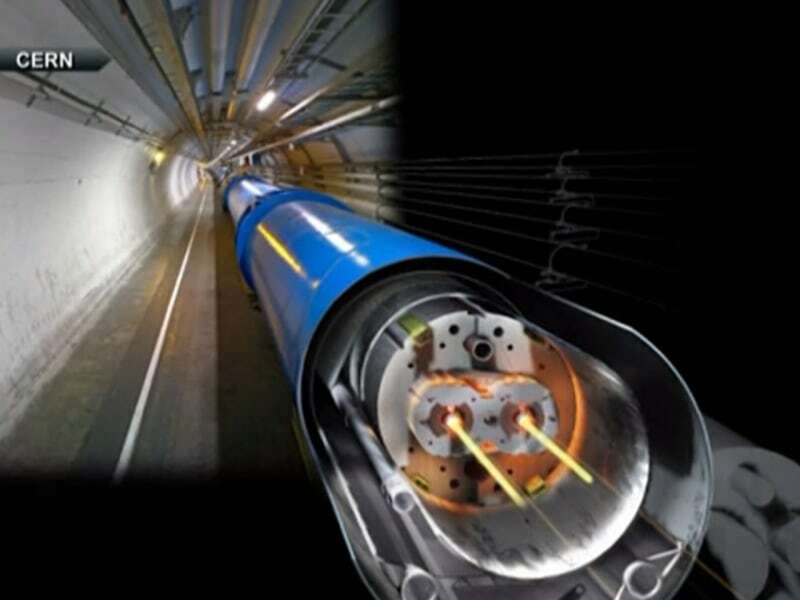 Be sure to tune in CERN's webcast starting at 3 a.m. ET for the latest revelations. Berkeley Lab: What's up with the Higgs?